Faster Travel adds two new tabs to the default world map information/navigation control and suggests approximately the closest known wayshrines to your current quest objectives. Also supports joining Cyrodiil campaigns and Transitus Wayshrines also with quest tracking and tooltip display! 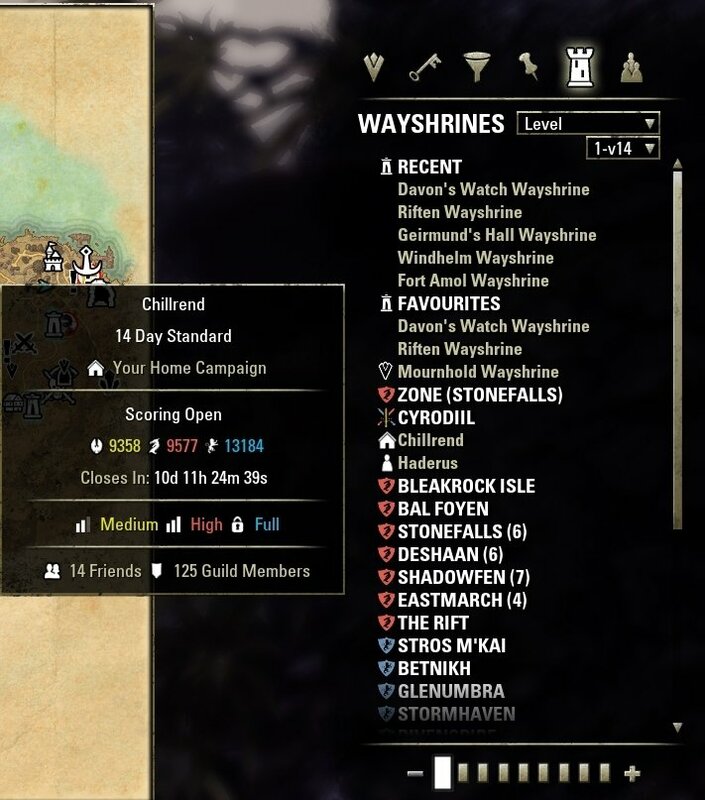 Displays the closest known wayshrine to your quests by marking them with the quest's icon from the map (when it is possible to obtain the data ). Displays quest objective tooltips when the mouse is over quest icons. All fast travels and recalls use the appropriate standard confirmation dialog. Use a wayshrine or open the world map. 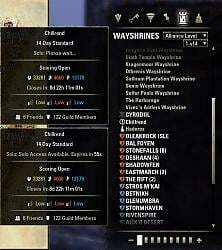 Right click in the wayshrines menu to add and remove favourites. /goto @PlayerName - attempts to teleport to a player. Also, you can save the player name in alias. - Bump API for Murkmire. as an interim solution it is hidden from view as well. - /agoto without arguments now lists existing aliases, "/agoto key" removes an alias for "key"
- Added "/f5housing on|off" command to dynamically enable/disable WfD's fix for house preview. This fix, unfortunately, has a side effect - cancelling a teleport must be done TWICE. - Under new management (for now at least). Thanks XanDDemoX for your awesome addon. It's all yours if you decide to come back. - Thanks to @SimonIllyan and Upyachka who also provided the last round of updates. - This version should now work with Wolfhunter. - Updated for API 100012 - Thanks Garkin! - Fixed teleport during interaction fall through map bug. - Added favourites category and right click menu. 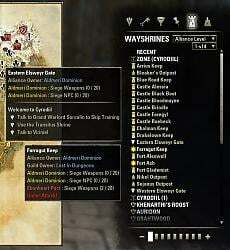 - Added Craglorn Trial wayshrine support. - Added teleport error detection and attempt next player upon failure when teleporting by zone name. 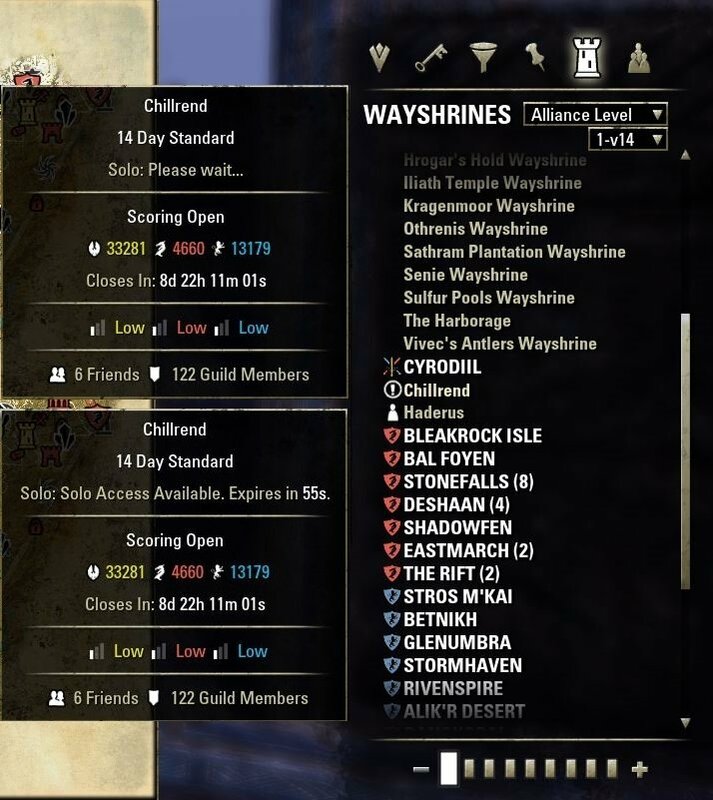 - Removed prefix from Cyrodiil queue status displays. - Fixed potential error message when clearing icons on world map open. - Fixed AD faction order table in LocationData. - Fixed Keep names for multi-language. - Switched to string ids for sort order text for localisation. 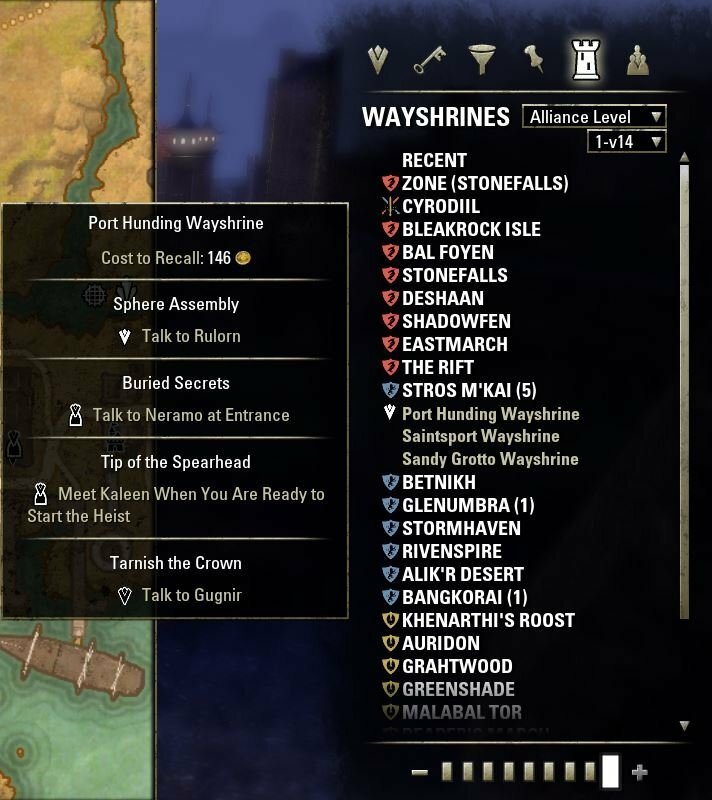 - Fixed Alliance level ordering descending moving Cyrodiil to the bottom of the list. - Added check to ensure keeps under attack do not have their icon switched to a quest icon. - Fixed quest tracker adding quests to campaign tooltips. - Added queue individual/group queue context resolution. - Fixed potential error message from nil coordinates. - Fixed incorrect campaignId for Home campaign. - Fixed faction order not updating on travel. - Added campaign queue status display on tooltips and icons. - Added keep under attack status detection and display. - Added of location re-ording user interface. - Added campaign display and joining outside of Cyrodiil. - Added campaign tooltip for display of campaign population and status. - Added panning to keeps. - Performance improvements to quest tracker. - Fixed wayshrines / quests not being invalidated on campaign state initialised. - Implemented quest display for Keep tooltips. 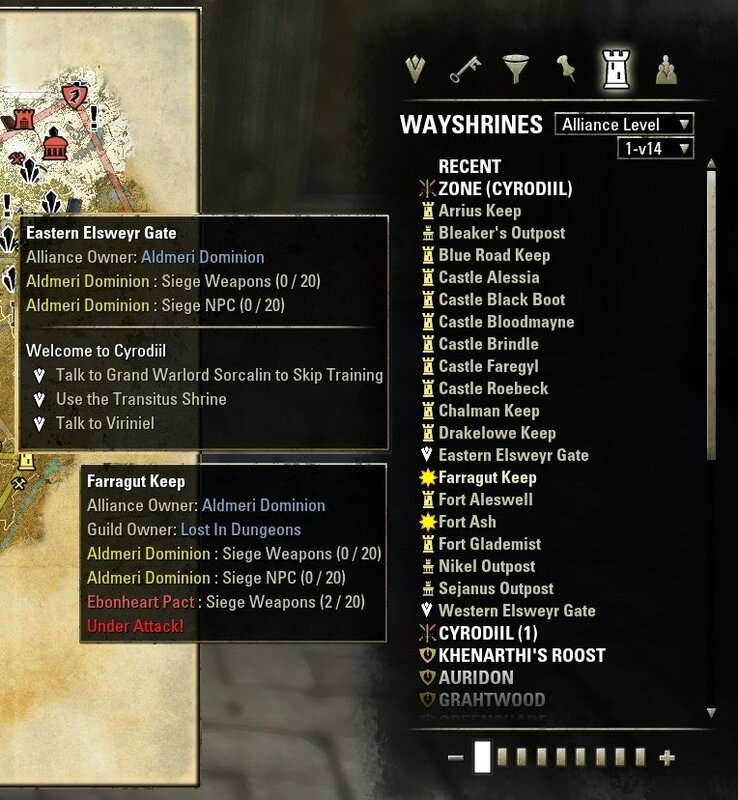 - Fixed Cyrodiil detection preventing display of keeps on initial entry. - Added zone ordering support. - Fixed recall confirmation not message being displayed outside of Cyrodiil preventing recall. - Fixed quest selection context menu not being hidden on world map hide. - Fixed error message attempting to teleport within a group where player is the leader and all other players are offline. - Added "Fast Travel Here" text. - Fixed tooltip display within Cyrodiil not displaying recall disallowed. - Fixed confirmation travel confirmation message being displayed when recall / travel disallowed. - Fixed Main Quest and Crafting quest markers not appearing. - Fixed error message on attempting to focus quests from recent list. - Fixed setting map to quest objectives potentially changing the current map inside a delve / city. - Fixed ordering of quest objectives potentially not updating when the tracked quest has been changed. - Fixed recall cost display not updating during cooldown. - Added support to quest tracker for displaying quest objectives on the recent list. - Added sorting of tracked quest objectives to the top of tooltips. - Added displaying wayshrine name in tooltip. - Added recall cost display to tooltip. - Added displaying quest names, objectives and objective icons in tooltip. 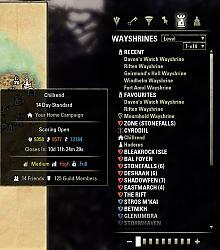 - Improved wayshrine tooltip layout and formatting. - Added support to quest tracker for quest objectives potentially spanning multiple wayshrines. - Fixed quest tracker potentially not displaying all quest objectives for some quests. - Fixed quest tracker displaying all objectives against wayshrines which are closest to one or more objectives. - Fixed zone category displaying Tamriel as location in delves and dungeons of Coldharbour. - Fixed quest tracker requesting positions for all quests on each refresh. - Filtered quests from other zones being added to keep quests icons and tooltips contextual to the zone. - Improved quest closest wayshrine resolution in quest tracker. - Fixed issue where zone location could change to the parent zone in areas such as Bal Foyen upon a ui reload. - Moved Readme and Licence into FasterTravel folder within zip for users who use Minion. - Fixed error message when opening the store with with the Wayshrines or Players tab displayed. - Fixed unformatted strings potentially being saved into saved variables via recent list. - Fixed error message when opening map in an unknown location / main quest dungeon. - Fixed location detection potentially resolving the current zone incorrectly in some dungeons. - Fixed quest markers potentially not appearing following a location change. - Fixed location detection potentially resolving Tamriel in a known location. - Fixed guild categories on players tab opening in their initial state. Could the menu item "ZONE (current zone)" be closed by default? Or could there be an option for it to be closed? No matter the answer, thanks for an awesome add on! Try uninstalling via Minion (keep your settings) and reinstalling. This project is in maintenance only which basically means that it will be carried along from release to release but no new features will be implemented. It also means that bug fixing is going to be very slow. I took this over because I use it and thought that we had a maintainer who was interested in being active but they disappeared shortly after dropping a big chunk of changes into the add-on. Hi. Please tell me you can somehow remove from the tab player dungeons and other places where it is impossible to teleport, they just clutter the list and make it difficult to find target locations. ※This UI error comes out 100% when I try to teleport to the wayshrine of the brass fortress of Clockworks City and Quest objective tooltips are not displayed even when mouse over. Does not it work in Japanese version ESO? Last edited by Siegtime : 12/04/18 at 08:02 AM. can you do smthing about it? I have a strange issue when trying to teleport from map. I get twice the tp dialog if I refuse to teleport at the first one, no error message, no LUA error, just make the TP dialog appear twice. 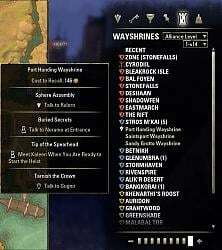 Another question is, do you think it could be possible to replicate an old mod behavior which made possible for you to click on any Wayshrine and this uses the closest guy around the place you want to go automatically as a target. Anyway, thank you for this mod. The "cancel TP dialog" problem is documented in README. You can fix it using "/f5housing off", at the cost of having house preview options broken again; it seems you can't have both working correctly at the same time. As for "closest guy", I believe it was never the case - the API does not disclose the precise location of other players, only the zone they're in; so it is just "anyone in target zone", which can result in TP to a different wayshrine in the target zone than you wished for. how do I set an invidual setting for a favorites tab? Last edited by vecny.samotar : 09/18/18 at 09:09 AM. I'm unable to reproduce this problem. Which version of the addon do you have - 2.2.3 or earlier? Is the message repeatable, ie. does it show again when you do the same thing? I am NOT happy with the 'favorites' being across all characters with no option to turn it off! I have specific favorites for my crafter, my questers, and the one to travel to Guild Traders... and then when I log in after the update, ALL my favorites are gone across all characters. PLEASE give the option to turn this on or off!! Probably in the next version I'll add a switch for that. Or, maybe, TWO separate categories - Player's Favorites and Character's Favorites? What are your opinions on that? Last edited by SimonIllyan : 09/04/18 at 06:07 AM. Last edited by A_Darklore : 09/03/18 at 05:25 PM.